LIVE REPORT: umbrella - ONE-MAN 【Chapter.3 「TAION」】+ Live Information | VKH Press – J-Rock & Visual Kei Coverage Worldwide! 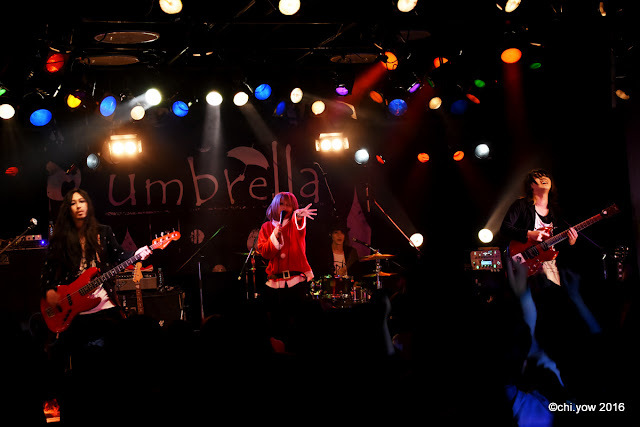 umbrella finished off the year 2016 with a hot one-man live at OSAKA MUSE on December 16th. 2017 already looks to be packed with exciting events, with two new ones announced at the one-man. To commemorate their sixth anniversary since formation, umbrella announced that their next one-man will take place on March 14th at Zirco Tokyo, the title following their current naming theme with 【Chapter.4 「 FUMIIDA」】. Additionally, to celebrate Hal’s birthday, Shibuya REX will host their event titled 【アマヤドリ～MUROKA～】on April 27th, featuring bands heidi., THE NOSTRADAMNZ , TЯicKY, UCHUSENTAI:NOIZ, and special guest Kojima Hoden from Mitarashinu. Live report by Chi-Yow Lee.